Welcome to this issue of newsletter delivers you updated info. Thank you for your continuously support to RAYSTAR News. In June, we will introduce 2.4” & 2.8”TFT modules. RAYSTAR will have half yearly stock-taking in late of June for Taiwan, China and Myanmar plants. Please note that we will stop shipping and receiving shipment during this period. Below are the last shipping date before the inventory check and the first shipping date after the stocktaking for your reference. 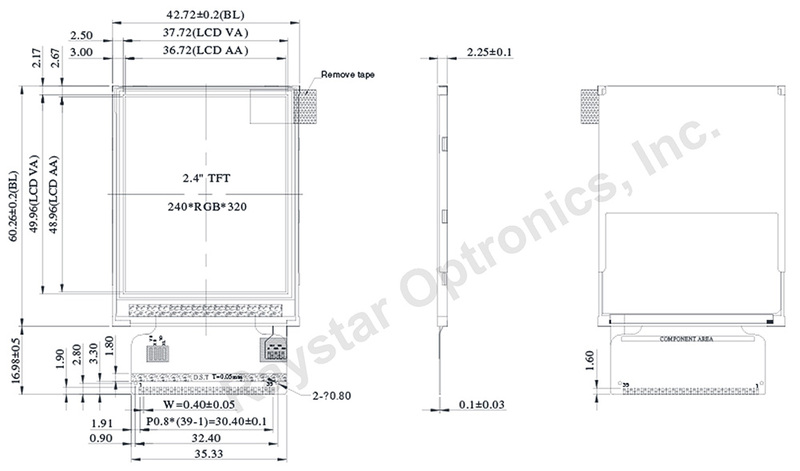 Please work with your RAYSTAR sales persons closely before the stocktaking if your shipment might be affected. Thank you. 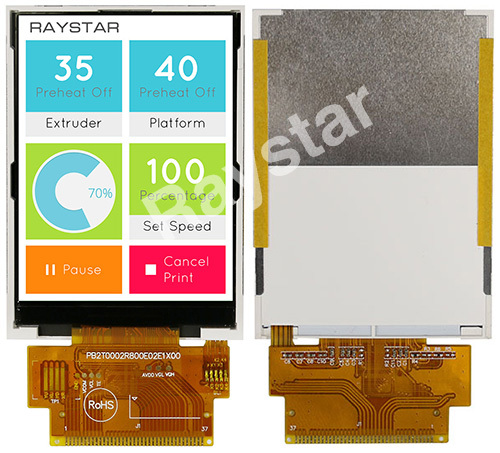 RFJ240H is a 2.4 inch diagonal full color 240x320 TFT LCD display module. This module is built in with ILI9341V IC; it supports 8/16-bit 8080-series Parallel MCU Interface. RFJ240H model is having module dimension of 42.72 x 60.26 mm and Active area size of 36.72 x 48.96 mm; it integrated ILI9341V controller on module, logic supply voltage range from 2.4V to 3.3V. RFJ240H is portrait mode LCD module, if you would like to use it as landscape mode, please contact with us for more technical support. This 2.4” TFT LCD module is featured with brightness up to 500 cd/m2(typical value), it can be operating at temperatures from -20℃ to +70℃; its storage temperatures range from -30℃ to +80℃. 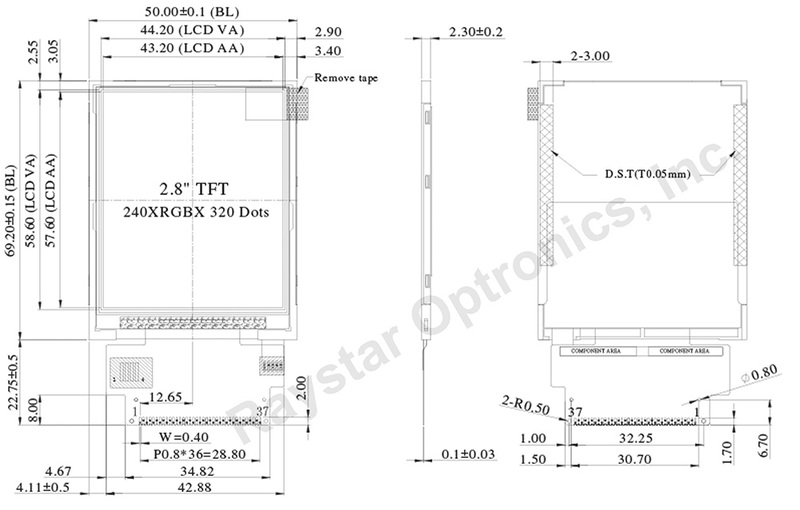 Below is the basic spec information for RFJ240H as reference. 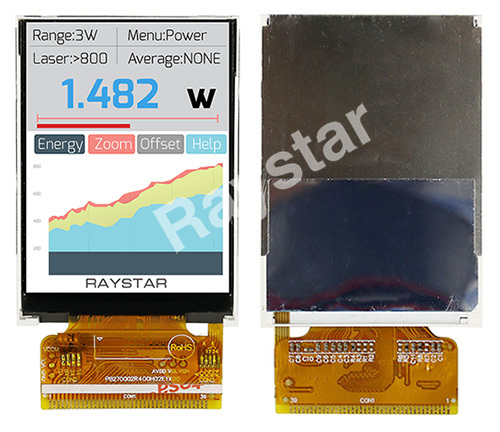 RFJ280E is full color 240xRGBx320 TFT LCD display module, diagonal size 2.8 inch. This module is built in with ILI9341V IC; it supports 8/ 16bit 8080-series Parallel MCU Interface. RFJ280E model is having module dimension of 50.0 x 69.2 mm and Active area size of 43.2 x 57.6 mm; it integrated ILI9341V controller on module, logic supply voltage range from 2.5V to 3.3V. RFJ280E is portrait mode LCD module, if you would like to use it as landscape mode, please contact with us for more technical support. This 2.8” TFT LCD module is featured with brightness up to 500 cd/m2(typical value), it can be operating at temperatures from -20℃ to +70℃; its storage temperatures range from -30℃ to +80℃. This 2.8" TFT LCD Module 6:00 o'clock viewing direction works well for devices that is easy to read above eye level without fading, such as signal analyzers or bench top laboratory equipment, handhold microscope and other handhold devices.